Wisconsin is bordered on the east by Lake Michigan and by the Mississippi River on the west. 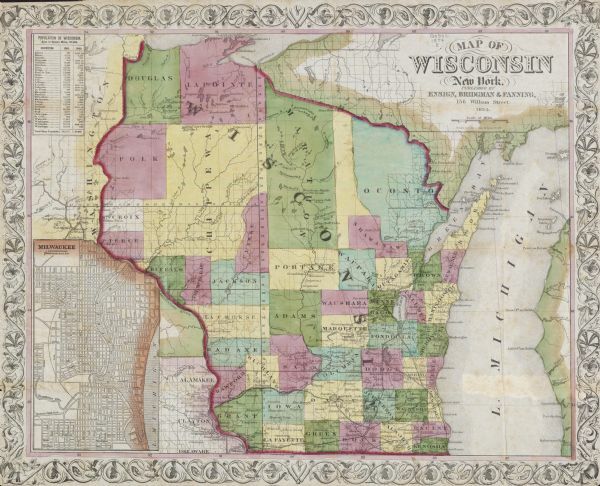 A line run across the prairies by surveyors in 1832 separates Wisconsin from Illinois. Another line run in 1847 divides the state from Michigan's Upper Peninsula. The eastern lakeshore is low, sandy and marshy and has few harbors deep enough to handle large ships. Wisconsin's western edge is formed of immense bluffs overlooking the Mississippi, punctuated by steep ravines. The southern border runs through flat, fertile land watered by shallow rivers. The northern boundary crosses through dark forest relieved by high wetlands and lakes. The rich prairie becomes increasingly hilly from east to west in southern Wisconsin. There are few large tracts of level land west of Madison. The northern forest is very dense past central Wisconsin. It grows thinner southward, until it gives way to open lands past Green Bay and Prairie du Chien. Human history began in America's river valleys, which provided easy transportation, nutritious soil for growing food and diverse habitats for game animals and birds. The rivers tend to flow either northeast into the Great Lakes, or southwest into the Mississippi. The state is bisected north to south by the Wisconsin River, which starts in the forest near the Michigan line at Lac Vieux Desert and runs south to Portage, where it veers southwest and flows to the Mississippi. Today's rivers, lakes and landforms are the result of glaciers that slowly drifted down from the north during successive ice ages. 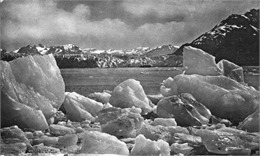 Most of the state was shaped by these glaciers, some of which were a mile thick. The last of them was the Laurentian Ice Sheet, whose petal-like lobes stretched down over Wisconsin about 17,000 years ago. The southwestern third of the state was untouched by these glaciers, creating unique formations such as the Wisconsin Dells, Devil's Lake and the Baraboo Hills. This so-called "driftless area" contains many ancient landscapes that Wisconsin's native peoples have considered powerful and important.